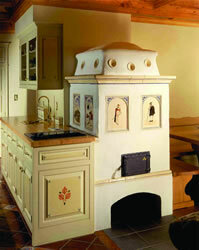 Vermont Woodland Cabinets offers a variety of finishes. Using our skill and learned techniques our finishes are beautiful and long lasting. We are knowledgeable in the traditional applications and keep current with the latest trends. Using green products, along with labor saving painting techniques, we are saving time and money with great results. Our cabinet shop uses finishes and paints that are low in VOC’s, thus eliminating the use of potentially hazardous chemicals. We offer hand sanded finishes including natural, glazed, stained, and distressed faux. We hand select our woods for color and grain, and we mill locally to insure quality.